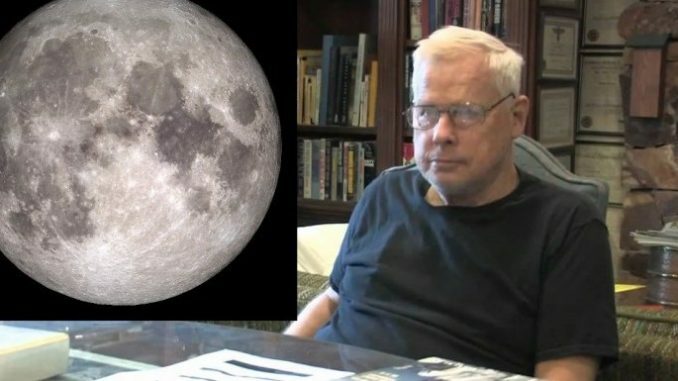 Former CIA pilot John Lear has sensationally claimed that the Moon is currently home to well over 250 million citizens. Lear claims the Moon’s citizens are hybrid humanoid aliens who live beneath the lunar surface, working in huge laboratories on jointly run projects with the U.S. government. Anonymous reports: “Everything you heard about the Moon is a lie,” exclaimed Mr. Lear. He said he has discovered secret structures on the Moon and furthermore, showed some images that allegedly show proof of these artificial formations. Amateur astronomers have recently recorded something that looks like a holograph projection of the Moon’s surface. There are many conspiracy theorists that believe that some kind of a science or technology is hiding the structures on the moon. So, this holographic technology might actually be the one that covers them up. The first visits to the Moon most probably happened thanks to the Tesla’s anti-gravity craft. I can’t prove this of course or I’d be dead already. I can’t show you a picture of the USS Enterprise up there now. It’s just what makes sense knowing the technology gained after the US government pumped billions or trillions into all of Tesla’s research,” claims Lear. In Lear’s video, you can observe some photos taken from an observatory in 1946. They apparently show a big catastrophe that happened north-west from the Endymion crater. He further continues explaining how the Moon was made inside of Jupiter 40 million years ago. Allegedly, during the last ice age, 15,000 years ago, the electromagnet trajectory was stuck in the Earth’s orbit. Thus, he claims, the big cities, civilizations and bases on the Moon started showing up. Lear described the Moon’s citizens as humanoid aliens. He also said that among them there is also the race of the Greys, but they live under the Moon’s surface, working in enormous laboratories. To sound even weirder, he said that the Earth is actually a planet-prison that serves as a place for punishments. There are millions of others planets like Earth, he stated. John Lear has some unbelievable ideas and claims, so it’s not strange he is being a subject of constant jokes among the rationalists. However, this former CIA pilot was also a former captain of the US air forces. He has operated more than 100 different planes and has many certificates that prove his expertise.